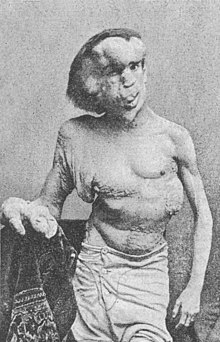 Joseph Carey Merrick (5 August 1862 – 11 April 1890) was an English entertainer and poet, who became famous as "The Elephant Man". The mind's the standard of the Man. Factual inaccuracies are believed to exist in the original document. I first saw the light on the 5th of August, 1860, I was born in Lee Street, Wharf Street, Leicester. The deformity which I am now exhibiting was caused by my mother being frightened by an Elephant; my mother was going along the street when a procession of Animals were passing by, there was a terrible crush of people to see them, and unfortunately she was pushed under the Elephant's feet, which frightened her very much; this occurring during a time of pregnancy was the cause of my deformity. My feet and legs are covered with thick lumpy skin, also my body, like that of an Elephant, and almost the same colour, in fact, no one would believe until they saw it, that such a thing could exist. It was not perceived much at birth, but began to develop itself when at the age of 5 years. I went to school like other children until I was about 11 or 12 years of age, when the greatest misfortune of my life occurred, namely — the death of my mother, peace to her, she was a good mother to me; after she died my father broke up his home and went to lodgings; unfortunately for me he married his landlady; henceforth I never had one moment's comfort, she having children of her own, and I not being so handsome as they, together with my deformity, she was the means of making my life a perfect misery; lame and deformed as I was, I ran, or rather walked away from home two or three times, but suppose father had some spark of parental feeling left, so he induced me to return home again. In consequence of my ill luck my life was again made a misery to me, so that I again ran away and went hawking on my own account, but my deformity had grown to such an extent, so that I could not move about the town without having a crowd of people gather around me. I then went into the infirmary at Leicester, where I remained for two or three years, when I had to undergo an operation on my face, having three or four ounces of flesh cut away; so thought I, I'll get my living by being exhibited about the country. Knowing Mr. Sam Torr, Gladstone Vaults, Wharf Street, Leicester, went in for Novelties, I wrote to him, he came to see me, and soon arranged matters, recommending me to Mr. Ellis, Bee-hive Inn, Nottingham, from whom I received the greatest kindness and attention. In making my first appearance before the public, who have treated me well — in fact I may say I am as comfortable now as I was uncomfortable before. I must now bid my kind readers adieu. This page was last edited on 13 January 2018, at 00:13.